Classic Japanese cinema led to the development of many of today’s contemporary action films. Kudo Eichii’s Eleven Samurai (1967) is a perfect example of the genre. In one of the greatest films to come from Japan, the lord of the Oshi fief is killed by his trespassing neighbor, the cruel and despotic Nariatsu, son of the former Shogun. After a biased investigation, the Oshi clan is blamed for what happened and sentenced to be disbanded. 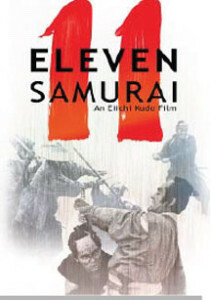 Eleven of the best samurai of the clan refuse the sentence and are willing to give their lives for justice. Noted director Kudo Eiichi reached the zenith of his career with this exciting film about the turbulent days of the Oshi clan! Featuring an all-star cast in one of the most memorable motion pictures from the Toei studio. For group screening prices, please inquire.